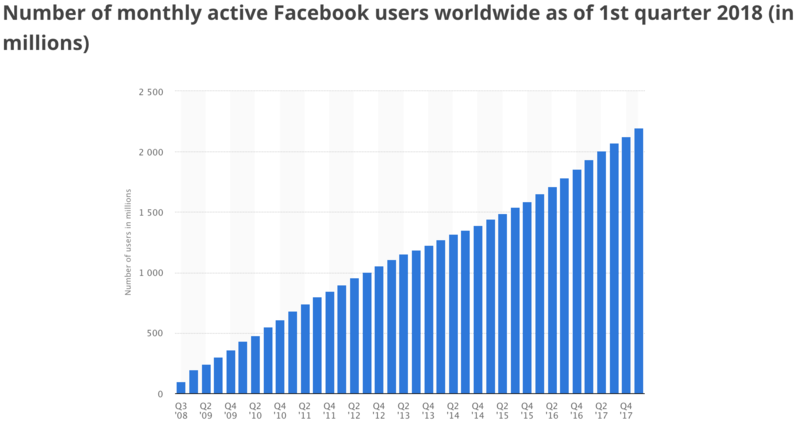 2.3 billion users worldwide -- that's how many "users" Facebook has grown to as of the first quarter of 2018. 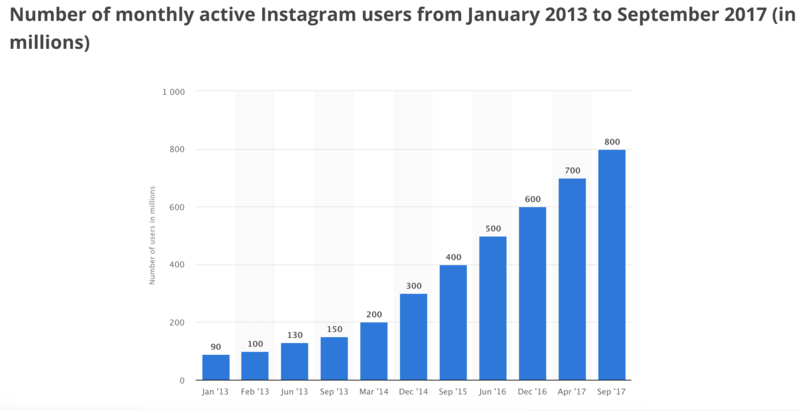 800 million — in September 2017, that was where bean counters placed the number of global users on Instagram. And, unsurprisingly, the country with the highest number of these users? That would be the United States, with Brazil, India and Indonesia close behind. Really take a moment to consider these numbers because the numbers paint a compelling picture. For businesses, these numbers mean that a significant portion of their users exist online on "social networks" — two of the biggest of which are Facebook and Instagram. This is a picture that includes the potential that businesses have to reach a wider audience on platforms where users -- individuals -- already exist at no extra cost to them. It would be the real-world equivalent of having everyone gather in the town square and to be able to market to them directly. 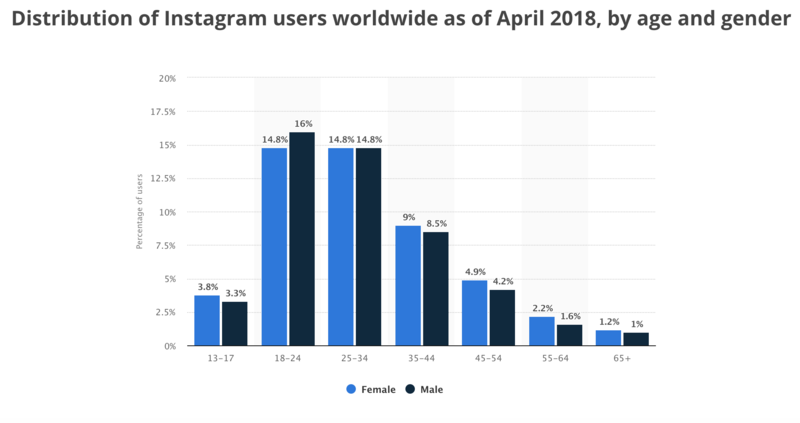 Conveniently enough, Facebook's purchase and subsequent integration of Instagram has meant that the advertorial power that the social media giant wields now also extends its "reach" (no pun intended) to Instagram users. The first place to get started with social media? Not on social media. Instead of trying to pick your platform(s), begin with what you've already got: Visual elements, brand collateral and the visual identity that has been built into your website and business. This includes logos, fonts, typographic style elements, graphic elements, brand colours, icons and even the brand "voice". For example, let's take two fitness businesses. Both businesses offer products and services related to fitness. One product that is similar across both businesses are branded "Bikini Body" guides. It might seem repetitive and as though the two businesses would be direct competitors. In some ways, they are. However, their audience is vastly different because the tone of voice, the values and the perceived intensity of the fitness guides are all perceptions that are translated through visual elements. A potential customer's decision to put their vote of confidence in one business over another and purchase similar products according to their preferred business is based, here, on the consistent visual elements. What elements speak more to what type of buyer? As you can see, the filters and visual elements include particular fonts and pink, peach, aqua and teal overlays and buttons. Now take a look at their Facebook and Instagram identities. 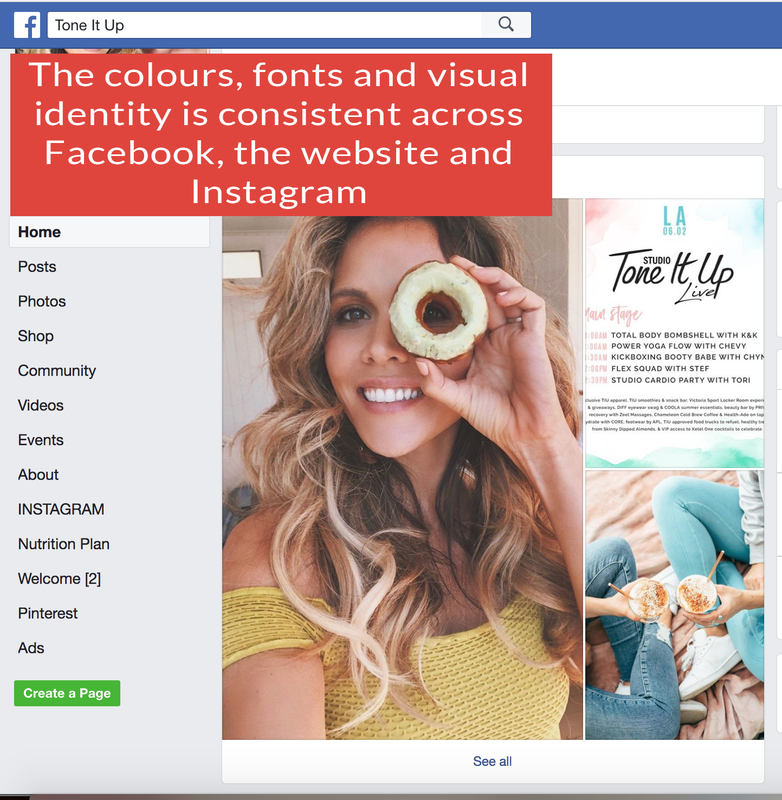 Notice how the colours are carried through on all posts on Tone It Up's Instagram account. The brand has a clear target audience, based on its choices in visual elements. It seems to be focused on women who love the beach, the west coast and it has a very fun, flirty and feminine feeling. Sunny day and toned bodies come to mind. And any customers who align and identify with (or even simply aspire to) this will be their target potential buyers. 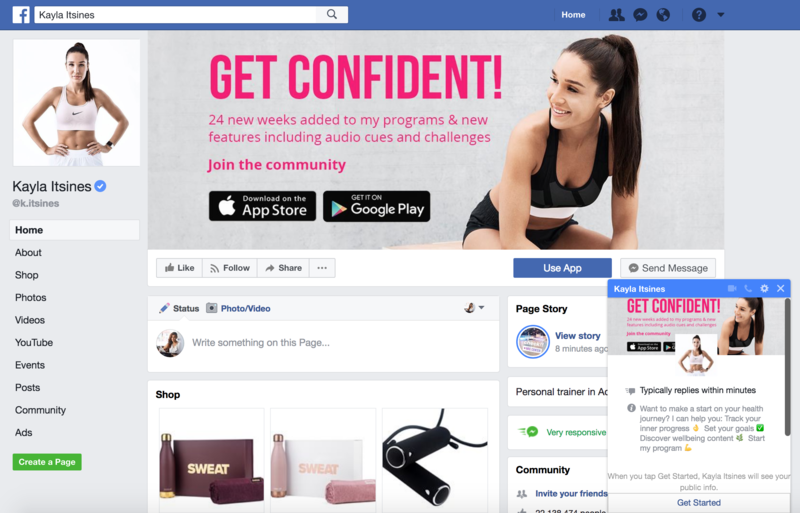 Now, let's take a look at the mobile-view of Kayla Itsines, a self-styled "personal trainer" focused on producing "Bikini Body guides". There is a continuity of pink, black and white. The brand seems to be geared towards women but the focus or the "tone" of the values conveyed are more reminiscent of a company like Livestrong. Target customers are those who identify as women but women who are strong and "intense" (as seen above), rather than flirty and beachy. Aligning your website and brand content on social media puts you, the business, in the driver's seat. Consider this your moment to craft your brand's identity in a way that shows continuity across platforms. How users will respond is based entirely upon the value you provide, the engagement you offer and the consistency of your posts. But the recognition of your brand and business on particular social media platforms will benefit from this alignment. Audience insights procured from Facebook and Instagram are the next stage of your foray into social media. Once you've managed your first goal — establishing your brand's presence on your preferred social networks — your next "to-do" is to begin monitoring, tracking and analysing your target customer. Who is liking, sharing and responding to (and on!) your posts? Where did these individuals come from? For example, were they referred to your social platform through your website or through another website where you've been advertising? Did they come from your mailing list? Where are they going to next? You'll also want to get a sense of who these individuals are. Use these demographic indicators to start learning about the decisions they make, the online behaviour they demonstrate and the values they hold. This can be further narrowed down using voice-of-customer research in interviews, surveys and surveying competitors' products/services. Remember that picking the right network to establish your presence on should be based on a combination of which platform feels right for your business's niche (ex. a B2B outfit would do better on LinkedIn and Facebook than Pinterest) as well as where most of your users already live. The next step on from gaining insights is to actually be using them. Facebook's ads platform allows brands and businesses to use their initial insights to set up a very logical and cohesive campaign. Firstly, their backend targeting system known as the "Power Editor" can get very specific and granular with targeting. Secondly, targeting and retargeting techniques include something called "Lookalike audiences," which allow a business to harness their mailing lists and find a whole new crop of users to target, based on who has already opted in. Thirdly, Facebook ads can be published on Instagram as well, thanks to the purchase and integration of the two platforms. 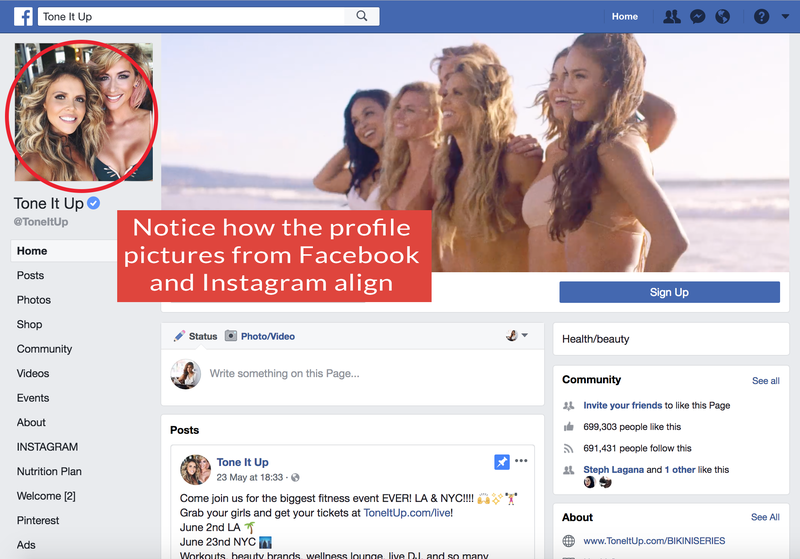 And, lastly, brands and businesses can set up campaigns with different goals; Facebook's ads function like a "funnel", getting more and more specific over time, and guiding a user through to purchase. While there is a simple learning curve to targeting audiences on Facebook, the backend of running campaigns can becoming complex. With multiple goals and the ability to retarget users who have already clicked on the first part of a Facebook ads campaign, managing the backend as well as adjusting ads to produce the best ROI for your ad spend can become a process of continual refinement. At Mornington Peninsula Web Design, we focus on delivering website development services in a way that is accessible for any format of business. From done-for-you web development services to deep-dive strategy work in digital marketing, we keep the bigger picture of your online brand in mind, leaving you to focus on your zone of genius — running your business. Learn more about how we've helped dozens of local businesses transform their marketing efforts, making them "pros" in more than one way: Profitable, professional and productive.